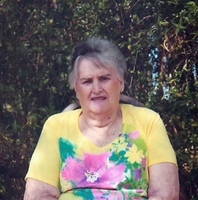 Provide comfort for the family of Jessie Mae Howell with a meaningful gesture of sympathy. Jessie Mae Howell, 83, entered into her Heavenly home from Baptist Nursing Home in Calhoun City on Thursday, January 17, 2019. Born March 3, 1935, she was the daughter of the late Everette Marion Russell and the late Bertha Hollis Hitt. She attended Sabougla High School, and was a member of Pleasant Hill Baptist Church. Among her many hobbies were singing and playing the guitar. She also loved to be sitting in front of the tv watching her Westerns. Her greatest treasure was spending time with all of her grands. Having 33 grands, great-grands, and great-great grands, her life was filled with the joy and happiness that a large family provides. She loved getting out and riding around seeing her family and enjoying God’s nature. Always putting the needs of others before herself, she had a heart of gold, and was well known for her sweet nature and giving soul. She will be deeply missed, but her memory will be cherished forever in the hearts of her family and friends. Pryor Funeral Home is honored to be serving the Howell family. A funeral service celebrating her life will be held Saturday, January 19, 2019, at 2:00pm at Pryor Funeral Home. There will also be a visitation on Saturday, January 19, 2019 from 12:00pm until service time at the funeral home. Bro. Terrell McGreger will be officiating. Interment will follow at Pleasant Hill Cemetery. Serving as pallbearers will be Kirklin Crutchfield, Brad Crutchfield, Keith Parker, Josh Parker, Bo Howell, and Dekota King. She leaves behind her daughters, Lana (James) Crutchfield and Debra Crutchfield, both of Calhoun City, and Paula Blassingame of Randolph, MS; her sons, Tony (Julie) Howell and Jerry Howell, both of New Gauley, MS; brother, Billy (Dixie) Russell; 10 grandchildren, Jeff Howell of Calhoun City; Stacie Carraway of Houlka, MS; Tanya (Josh) Parker of Calhoun City; Brittany Crutchfield of Houston; Brad (Candice) Crutchfield of Baldwyn; Christy (Frankie) Hamilton of Calhoun City; Lisa Payne of Randolph; Bryan Howell of New Gauley; Cheyenne Howell of New Gauley, and Hunter Howell of New Gauley; 17 great grandchildren; and 6 great-great grandchildren. She was preceded in death by her parents, her husband, Travis Howell, six brothers, Calvin, Scoot, Russell, Robert, Joe Lee, and Rev. Larry Russell, her sister, Hattie Bell Malone, and grandson, Curtis Crutchfield. Expressions of sympathy may be left for the family at pryorfuneralhome.com. To send flowers in memory of Jessie Mae Howell, please visit our Heartfelt Sympathies Store. We encourage you to share your most beloved memories of Jessie Mae here, so that the family and other loved ones can always see it. You can upload cherished photographs, or share your favorite stories, and can even comment on those shared by others. Provide comfort for the family of Jessie Mae Howell by sending flowers.